Someone recently brought to my attention that since the half-removal of the border system, this concept has never been fully clarified, so I am here to do JUST THAT VERY THING. The basic principle here is: use common sense. That's it! Go how far you think you can go! That said, we at NarniaMUCK Staff Incorporated (tm) have put together some things to help you out, since virtual maps can get confusing. 1. The rooms are not full of path. The path is not a mile wide, nor are the rooms very small. There's lots of, sometimes RPable, space "around" the rooms. Take the apple tree in the fruited copse, for instance. There is one apple tree noted in the area. That's the one I've illustrated with big fruit, because it's pickable. However, the whole copse is actually 4 rooms big, with 4 pickable fruits or nuts, and each room is labeled "fruited copse" rather than "apple grove", "walnut grove", etc. That means that ICly, in each room you have a huge amount of space to pick a number of fruits. You don't have to just sit under the apple tree the whole time. Many rooms have potential for a lot more than is in the description. It's okay to move away from the apple tree to another less-described area. Just keep it in-theme. Pick some walnuts! Sit on a large boulder! Discover a patch of pansies! Look up in awe at a single tall pine among the leaves! Don't suddenly start climbing a cliff, or going for a swim in a never-before-discovered pond, though. In other cases, there's less RPable room. On the west, you'll notice that the rooms are cut almost in half by the cliffs, and the trees are very dense on the other side of the path. That's partly my own choice in mapping, but I've done that in places where the description indicates that you can't move around much beyond what's described. This is an excellent reason to make sure you know what the room description says when RPing location. Are there places for you to hide? (Yes in the forested rooms, possibly not near the Gathering Circle). Your fellow players will appreciate it if you keep this sort of thing in mind: and you can start choosing rooms to RP in with quite a lot of good forethought as you start considering how much they lend to creative spacing. Maybe you want a place where you can't be snuck up on. On the other hand, maybe you want a place where you have the liberty to surprise your friend with a hidden clearing full of clover. 2. a) Even within each box, the room description does not always fill up the whole box. By this map, there is plenty of empty space between the area described in the Gathering Circle and the place described in the room directly south: "Caldron Pool". Therefore, if it takes your character 15 minutes to walk a mile (the average human takes 15-30 assuming the terrain is not difficult), it could take her almost an hour to get to Caldron Pool. 2. b) On the other side of the coin, I could have drawn the Gathering Circle on the south side of the box and had had Caldron Pool pushing the northern limits of its box, it could take the same character 10 minutes. It's flexible! 3. a) In the case of landmarked rooms like the Gathering Circle and Caldron Pool, you don't want to be constantly waffling over how far the distance is. 10 minutes to an hour difference is not a HUGE deal, but it can get confusing. Unless there is an exceptional case, I recommend assuming about 30 minutes human walking distance between landmarks in adjacent rooms. 3. b) In other rooms, it's really no big deal. Take the Great River rooms east of Caldron Pool: They aren't VERY different from each other. They are basically just "forest". It could take you 2 minutes to get from Room A to Room B or 2 hours, depending on where you are in the room. That's up to you. 4. BUT now lets look at how long it takes you to get from the Entrance to the Training Cavern to the Lamp-post, which is one room east of what we have mapped here. Even though it might take 10 minutes to get your character from the Gathering Circle to the raspberry bushes in the room directly east, each of these rooms is still at least a mile long. That means, at the very shortest distance, it still takes your character an hour to get from the cavern through all 4 rooms directly east (that's assuming each room is only a mile and it takes your character 15 minutes to the mile). At the longest distance, walking at the more leisurely pace of 30 min./mile, it takes your character 4 hours. #4 is where the biggest flexibility comes in. Be sensible, think about your character's size and stamina, and travel accordingly. A Rabbit might never go more than 4 or 5 rooms away from his home in a day trip. A Wolf might go 15. Every Day Use: Here's what this means for borders: they are reminders. We don't expect you to be counting rooms. Borders are there to remind you how far you've moved. If you live in the Un'Aireken Dale: cross the south border into the Shuddering Woods! That's fine! They are two rooms away: perhaps as little as a half an hour or as much as two hours for a human. If you live in the south Sted Cair: visit the Great Woods to pick tansies from time to time! The borders are not there to force you to stay within specific rooms. They are there to remind you of what's practical. If you live in Bergdale, go ahead and cross into the western Great Woods. But don't take a jaunt all the way down to Winterden and expect to be back home in your hovel the same day. That's over 20 rooms, and even a Wolf would have trouble making the distance. Patrols: Here's where borders sometimes make more of a difference. They aren't put into place arbitrarily: there's often a cliff or river in place of a border. 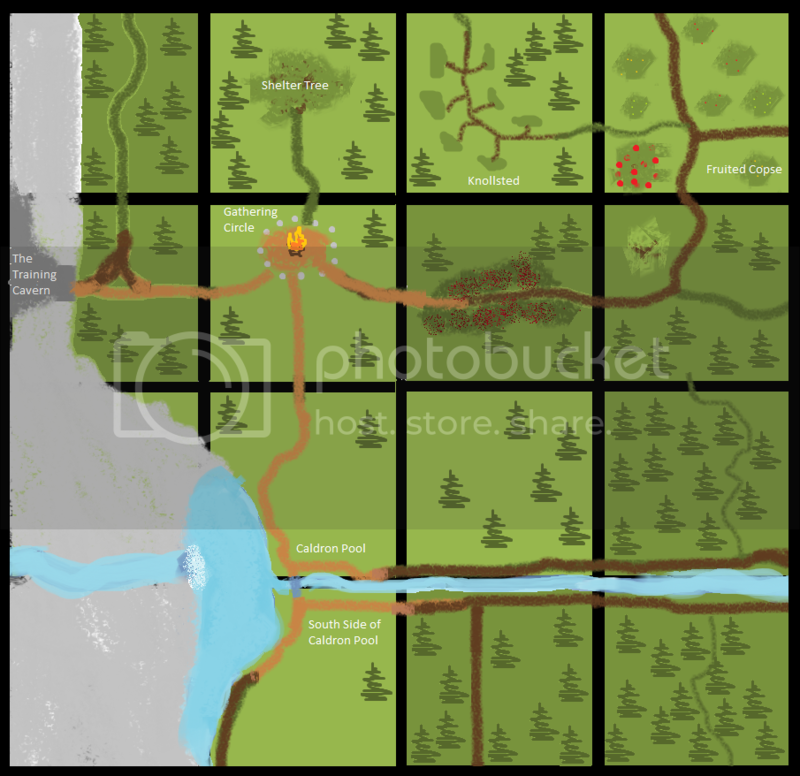 The Great Woods region, for instance, is pretty clearly set off as the wooded area south of the Great River. When it gives way to the southern mountains, that's Archenland. When it grows hilly and less treed on the west, that's Bergdale. It's not always exact, but where there's a cliff or river, go ahead and use that to help you figure out what area you might be "patrolling". Most of the moors are set off from Narnia by a cliff. The borders mark where that cliff is. Use them! But you can also be more creative and thoughtful. Lantern Waste only technically extends to about the Great River. Both by geography and distance from the den, it would make logical sense for that to be as far south as the Ulfden patrols extend (maybe the Unicorns patrol the south side of the river). Again, this is up to YOU. Be sensible. Use your borders as guides when they help, throw them out when they don't. If you have any thoughts on travel: questions, ideas, etc, please submit them at the forum thread on this topic: http://www.narniamuck.org/forums/viewtopic.php?f=8&p=2368#p2368 .